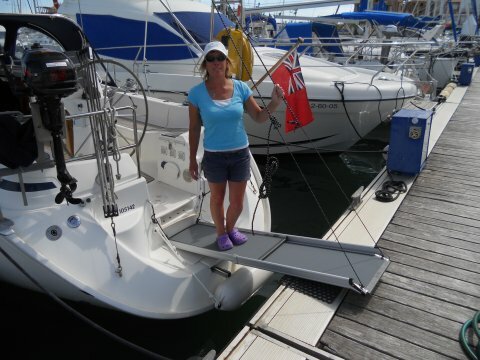 We stayed in the marina at Rota for 5 nights whilst very strong westerlies blew, coating the boat in salt and shredding the tip of our CA burgee. 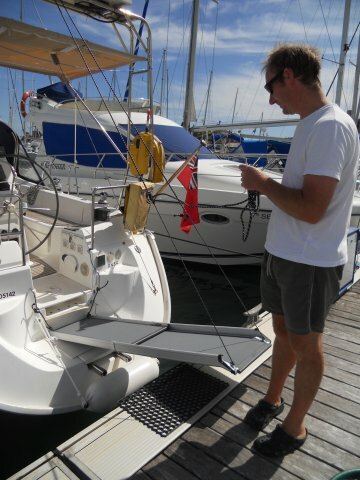 We later thoroughly washed all the salt off, and spent a few hours modifying the passerelle. Whilst there we met a couple, fellow CA members, who had spent 10 years in the Med. They invited us aboard their lovely HR42 for drinks one evening and their entertaining tales of their experiences gave us more inspiration for our new cruising ground, including the possibility which we had previously discounted, of sailing into Venice one day! 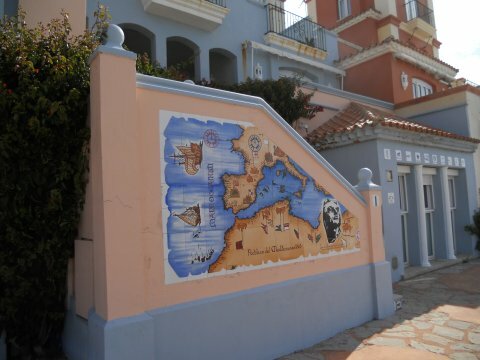 We had a wander along the seafront at Rota which was quite pleasant, but couldn't find the Tourist Office to find out about a bus to El Puerto de Santa Maria where we wanted to visit one of the sherry bodegas. Instead, on Wednesday, we moved to the anchorage off Puerto Sherry for the night then went into the marina at Puerto Sherry early on Thursday morning ready to head off for a tour of a sherry bodega. Puerto Sherry marina complex is a slightly strange place with substantial amounts of money obviously having been spent in its development. Much of it was done some time ago though, the marina berths are tight and the facilities could do with refurbishing. There are many unfinished buildings - one big hotel/apartment block sized one right next to the marina and many houses, but those houses that have been completed are really quite pretty and the hotel, bars and restaurants around the marina look pleasant enough. The walk along the seaward side (i.e. 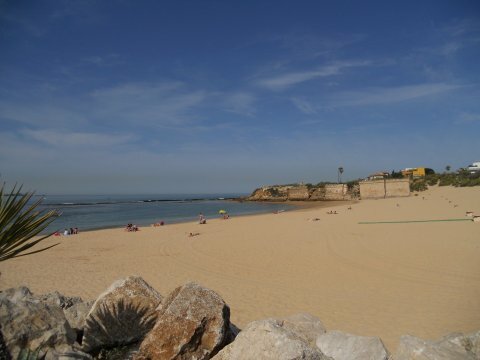 facing into the Bay of Cadiz) passes a lovely beach and several bars, cafes and restaurants. However, there was nothing there for us that justified paying more than double the nightly rate of Rota (and most other places we've been recently), especially considering the surprising amount of surge in the marina. Puerto Sherry marina complex, many quite pretty houses, but as you can see, several that are still unfinished shells. The beach on the seaward side of Puerto Sherry. 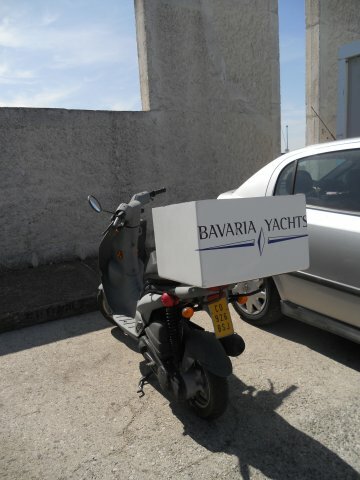 Whilst wandering around the marina, we spotted a type of Bavaria we've not seen before - could it be the new recession model? 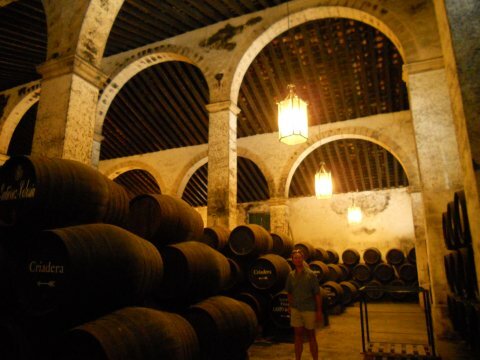 We had researched on the web for tours of the sherry bodegas here and decided on the Bodegas Gutierrez Colosia, based on it being the closest, having daily tours at 1300, a confirmation by email that the tour would be in English and happily, the least expensive at €4 each including a tasting. 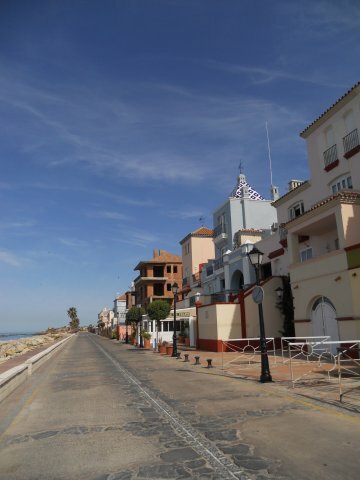 The walk along the promenade from Puerto Sherry took just over half an hour in the heat, but was lovely as it followed the beach around to the town of El Puerto de Santa Maria. It seemed remarkably quiet in the town, so we weren't too surprised to find we were the only ones present for the tour. At €4 each, we felt our 'private' tour was excellent value. The young lady who gave the tour spoke very good English and spoke informatively, passionately and interestingly about the history of sherry production and the different processes involved for producing different types of sherry. She also explained what effect the climate of the region has on the grapes themselves and also how the design of the buildings and their unique atmosphere influences the ageing process of the sherry. At the end of the tour, we expected to have perhaps a single tasting of one of their sherries, but instead, had a tasting of six different ones, accompanied by an assortment of savoury snacks to compliment the sherries and a video giving more details about sherry production. Truly one of the best value 'tourist trail' excursions we've had and we would highly recommend Bodegas Gutierrez Colosia to anyone interested in the sherry trail! The sherries were all really very different from each other and the (dry) fino sherry in particular was delicious and unlike any dry sherry either of us had ever tasted. Of course we stopped at the shop counter on the way out and bought two small bottles of the fino, a small bottle of a sweet sherry, also unlike any sweet sherry we'd tasted before, and a bottle of sherry vinegar. All surprisingly cheap too! 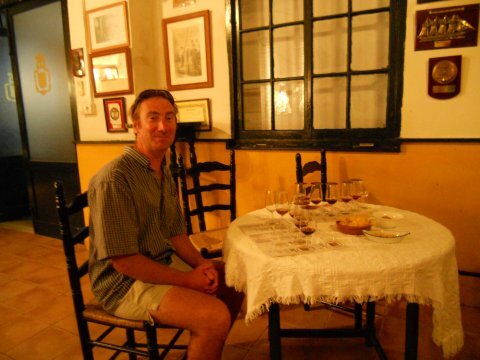 Six samples of sherry at the end of an excellent tour - no wonder he looks so happy! I think Andy was waiting for the 'treats' suggested to encourage him onto the ramp. 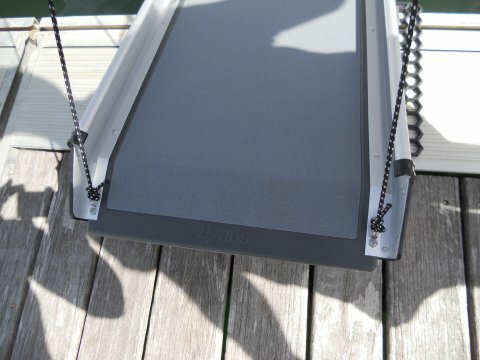 Shock cord attached to saddle clamps to keep the ramp off the quay when not in use. No splash - seems to work ok.
On Friday morning we returned to the anchorage, where we prepared passage plans for the next two days.